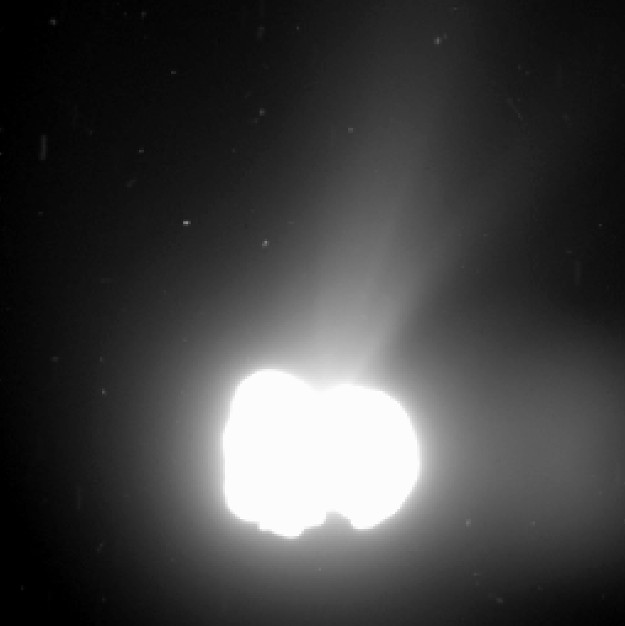 April 8, 2016 – For decades, scientists have agreed that comets are mostly water ice, but what kind of ice — amorphous or crystalline — is still up for debate. Looking at data obtained by ESA’s Rosetta spacecraft in the atmosphere, or coma, around comet 67P/Churyumov-Gerasimenko, scientists at Southwest Research Institute (SwRI) are seeing evidence of a crystalline form of ice called clathrates. Amorphous water ice efficiently traps large amounts of volatile compounds, which are released simultaneously upon warming. Water clathrates are crystalline structures containing gas molecules. The volatiles locked inside the water actually create the stable clathrate structure. These structures release gases at characteristic temperatures, dependent on the gas-phase volatile locked inside the clathrate. Luspay-Kuti led an international team of cometary experts that interpreted Rosetta spacecraft data, and found that the observed outgassing pattern indicates the nucleus of 67P contains clathrates. The multi-institute team of cometary scientists analyzed mass spectrometer data from the southern region of 67P from September to October 2014, before equinox. 67P is a Jupiter family comet thought to originate from the Kuiper Belt. Scientists are comparing these new data with data from the flyby of Hartley 2 — considered cometary kin in family and origin to 67P — and finding correlations. If these comets formed closer to the Sun than originally thought, these data could help refine solar system formation models. This research was supported by NASA’s Jet Propulsion Laboratory, Cornell University, the French National Research Agency, Centre National d’Études Spatiales, and the James Webb Space Telescope project. Rosetta is an ESA mission with contributions from its member states and NASA. Airbus Defense and Space built the Rosetta spacecraft. JPL manages the U.S. contribution of the Rosetta mission for NASA’s Science Mission Directorate in Washington, D.C., under a contract with the California Institute of Technology.